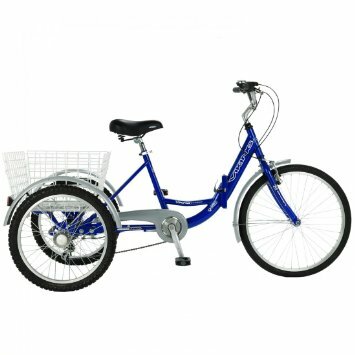 Model Type : Adult folding trike. Frame Construction : Hi-ten Steel with quick release folding mechanism. Forks : Hi-Ten steel. Frame Size : 16.5" Suitable for inside legs from 28" to 35". Wheel Size : 20" Rear with a 24" front wheel. Gear System : 6 speed gears with Revo twist shifters. Shimano rear derailleur. Wheel Specification : Alloy rims on steel hubs with 36 spokes. Brakes : Tektro alloy brake levers with parking brake. Front alloy "V" type brakes , rear drum brake. Handlebar and Stem : Alloy adjustable angle stem with hi-rise silver alloy handle bars. Additional Features : Sealed cartridge bottom bracket. 170mm steel chainset . Sprung comfort saddle. Mudguards, rear wire basket and chainguard. Weight: 27kg. Dimensions: Length 180cm . (118cm folded). Width 74cm. Basket Dimensions : 22"x 19" x 11" at widest points. 18x15x11" at its narrowest. Frame Colour : Blue. Fork : Blue. Cycle Condition : Brand new sealed in box. This trike comes 95% built. Fitting of pedals and front wheel required, gears & brakes will also need some adjustment.